Last month the Atomic Minerals Directorate for Exploration and Research (AMD) demanded a separate body to regulate illegal mining and export of beach sand minerals. Beach sand is rich in seven heavy minerals—ilmenite, leucoxene, rutile, zircon, sillimanite, garnet and monazite. They are processed to derive rare earth elements and titanium that are used in a variety of industries, including paints and cosmetics (see ‘Precious minerals’). Rampant illegal mining and export of beach sand minerals forced the National Green Tribunal (NGT) to impose a blanket ban on August 16 last year. Beach sand mining primarily happens in Tamil Nadu and Kerala. The mining ministry had till then issued 123 licences, of which 81 are for private players. Mining companies are required to take separate licences for mining each of the beach sand minerals. But since the seven minerals occur together, mining companies extract all the minerals without licences. The Indian Bureau of Mines, under the Ministry of Mines (MoM), gives approvals for mining garnet and sillimanite, and AMD, which is the research unit of the Department of Atomic Energy (DAE), gives licences to mine the remaining minerals. Also, DAE officials said last year that private mining companies are not filing statutory returns that show how much has been mined from a particular mining lease. Over 80 per cent of world’s titanium is derived from beach sand minerals ilmenite and rutile. India accounts for 15 per cent of the global titanium output. Over 50 per cent of titanium dioxide production is used to manufacture pigments in lacquers, paints and enamels. The dioxide, which absorbs ultraviolet light, is used in sunscreen lotions as well. Titanium’s non-reactive property makes it ideal to be used in the human body for orthopaedic use. Titanium is used instead of steel as the metal is 45 per cent lighter than steel, and twice as strong as aluminium. Zircon is used as foundry sand, in television screens and in the chemical industry. It is widely used in the ceramics industry. It is also used in leather tanning and paper coating industry, and in modern superconductors due to its high melting point. Garnet is a good abrasive and is used as a replacement of silica in sand blasting. Mixed with high pressure water, garnet is used to cut steel. Sillimanite rocks are used in the glass industry and in alumina refractories. AMD officials say checking such illegal cases becomes difficult as two bodies are responsible for giving mining licences for the minerals. This is the reason AMD demanded a single body to give mining leases during a meeting organised by MoM on January 9 this year. An MoM official told Down To Earth, since beach sand minerals such as monazite are rich in radioactive minerals, AMD should approve mining plans. A final decision is yet to be taken. India has the third largest reserve of beach sand minerals, with 13 per cent share of the world reserves. India meets 6 to 7 per cent of the world demand for beach sand minerals. According to the Working Group of Planning Commission for the 12th Plan, mining of beach sand minerals in India is expected to reach about 0.18 million tonnes per year by 2017, which will account for 10 per cent of the global production. In 2011-12, India exported 52 per cent of its beach sand minerals to China, 18 per cent to the Netherlands and 10 per cent to Japan, as per the data from Director General of Commercial Intelligence and Statistics. 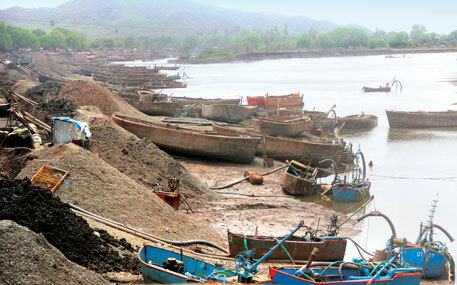 Illegal export of beach sand minerals increased after DAE passed a notification in 2007, allowing mining companies to export six of the seven beach sand minerals. The export of monazite was not allowed because it is primarily used to produce uranium and thorium, which are used as fuels for nuclear plants. The Indian Minerals Year Book estimates that India’s coastline has a deposit of 10.7 million tonnes of monazite, from which 846,477 tonnes of thorium can be extracted. A Tamil Nadu government-appointed task force found that between 2007 and 2012, about 1.35 million tonnes of ilmenite and 205,000 tonnes of garnet were mined illegally from the state. Monazite-rich sand was dumped near settlements (see ‘Hazardous mining’). “People working in sites where monazite-rich sand are illegally dumped often inhale the thorium-rich dust. Although, radiation exposure from beach sand mining is less than the permissible levels of DAE, over a period of time radioactive chemicals inhaled through dust can harm the lungs of the workers,” says PÃ”Ã‡ÃªMÃ”Ã‡ÃªB Pillai, a scientist with Indian Rare Earth Limited, the government agency that sells monazite. While very few studies on the long-term effects of monazite-rich sand have been conducted in India, global studies have found the process of mining these minerals is not safe. “It is difficult to obtain clean separation of ilmenite and monazite… Ilmenite concentrates obtained from such deposits often contain high levels of thorium and uranium,” states South African scientist J Nell in his study published in the Journal of South African Institute of Mining and Metallurgy in 2010. Another study published in the same journal in 2004 states that the existence of radioactive minerals like monazite is becoming an increasing problem. In a report to the Tamil Nadu government in 2010, the then Kanyakumari district collector Rajendra Ratnoo said he banned beach sand mining in the district after finding that V V Minerals, the biggest private beach minerals mining company in the country with a turnover of Rs 45 crore, was dumping monazite-rich sand after the chemical separation process. As a result, workers and residents were exposed to radioactivity. As per AMD guidelines, mining companies should backfill monazite-rich sand on the beaches and cover it with silica. V V Minerals filed a petition in the Madras High Court seeking to resume mining. The court lifted the ban as the district collectorate did not have the equipment to record radioactivity. Soon after, Tuticorin collector Ashish Kumar raided six quarries of private miners, V V Minerals and Beach Sand Minerals Company, and banned beach sand mining in the district. In a letter to the chief secretary of Tamil Nadu, Kumar complained that private companies had been mining beyond their lease areas. V Sundaram, former deputy collector of Tamil Nadu’s Tirunelveli district who in 2012 sought information about beach sand mining under RTI, estimates Rs 96,000 crore worth of monazite (approximately 0.15 million tonnes) has been exported illegally since private players entered the market in 1998. While AMD officials admit that the six allowed minerals are being exported illegally, they maintain monazite is not. According to S K Malhotra, head of AMD’s public awareness division, all processing facilities have to procure a licence from the Atomic Energy Regulatory Board for radiological safety. “DAE has taken initiatives to maintain vigil at ports and to strengthen sampling mechanism for monitoring beach sand minerals,” says Malhotra. In September 2013, MoM asked DAE to ban the export of all beach sand minerals by mining companies. Private mining bodies such as Mining Engineers’ Association of India (MEAI), however, are demanding that the ban on monazite export should also be lifted. “It will benefit society if private companies are allowed in the sector. Private sector is already engaged in its production in countries such as Brazil and Australia,” says T V Chowdary of MEAI. Mining ministry officials say the decision on a single body for clearances will be taken soon. Till then the approval and monitoring of mining leases will remain complicated.